San Andreas is a 2015 American action–adventure disaster film directed by Brad Peyton. The screenplay was written by Carlton Cuse, with Andre Fabrizio and Jeremy Passmore receiving a story credit. The film starsDwayne Johnson, Carla Gugino, Alexandra Daddario, and Paul Giamatti. Principal photography of the film began on April 22, 2014 in Australia and wrapped up on July 27 in San Francisco. The film will be released worldwide in 2D and 3D on May 29, 2015. 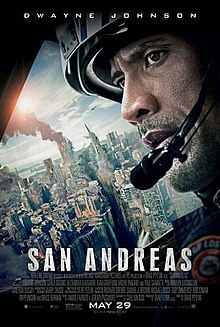 After a devastating earthquake hits California, a Los Angeles Fire Department rescue-helicopter pilot (Dwayne “The Rock” Johnson) and his ex-wife (Carla Gugino) attempt to leave Los Angeles and head to San Francisco to find and rescue their daughter (Alexandra Daddario). Tomorrowland (titled Disney Tomorrowland: A World Beyond in the United Kingdom)is a 2015 American science fictionmysteryadventure filmdirected by Brad Bird, and co-written and produced by Bird andDamon Lindelof. The film stars George Clooney, Hugh Laurie, Britt Robertson, Raffey Cassidy, Thomas Robinson, Tim McGraw, Kathryn Hahn, and Keegan-Michael Key. Walt Disney Pictures originally announced the film under the working title1952, and later retitled it to Tomorrowland, after the futuristic themed land found at Disney theme parks. Bird and Lindelof’s screenplay was heavily influenced by Walt Disney‘s optimistic philosophy of innovation and utopia, such as his conceptual vision for the planned community known as EPCOT. 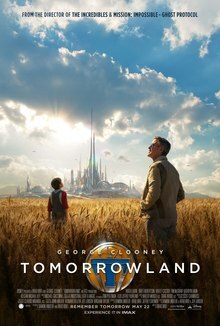 The film was released in conventional and IMAXformats on May 22, 2015.Tomorrowland was the first theatrical film to be released in Dolby Vision. The story then shifts to optimist and science enthusiast Casey Newton, who sneaks into a former NASA launch site in Cape Canaveral. She sabotages a machine that is being used to replace certain workers, including her dad Eddie, who is an engineer. Casey returns home, unbeknownst to Athena following her. Athena sneaks into the Newtons’ garage and leaves another “T” pin that is programmed to Casey’s DNA. The next night, Casey fails to break into the compound, and is arrested. At the police station, she discovers the pin among them her personal items. Casey discovers that upon contact, the pin instantly transports her to another world with a futuristic cityscape in the distance, and that she is the only one able to experience it. Retrieving the pin from her disgruntled father, Casey successfully returns to Tomorrowland and explores the advanced utopian city, brimming with technological innovation. However, a timer on the pin expires, and a frustrated Casey is returned back to her world.Frank Walker and Casey Newton are addressing an audience, about the future and describe their beginnings. In 1964, a young Frank attends the New York World’s Fair, where he meets renowned inventor David Nix. Frank shows him his jet pack that he built himself. Then Frank meets a young girl named Athena, who is taken with Frank’s enthusiasm for inspiration. Nix, however rejects Frank’s submission out. Athena approaches Frank and presents him with a pin embroidered with a “T” symbol, and instructs him to follow her aboard the fair’s “It’s a Small World” attraction. Frank sneaks onto a boat, where during the ride, a laser scans the pin on his shirt, and it takes him through an underground passageway, leading him into a pod that transports him to a mysterious place. Frank falls of a ledge onto another platform where he encounters a large robot that fixes his jetpack. During a mishap, Frank falls over again and soars over the futuristic city, much to the astonishment of its residents. He lands before Nix and Athena, with the former still unimpressed. Athena smiles and guides him through what is known as Tomorrowland. Casey and Nate find an address to a Houston science-fiction memorabilia retailer that supposedly sells that same pins as Casey’s. Casey leaves though Nate ends ups revealing her destination to Athena when she appears asking for her whereabouts. Arriving at the shop, Casey meets the two shop owners, Hugo and Ursula. When Casey shows them the pin, they ask her if she saw something and where she found it. Casey says she got it after she was arrested, prompting Ursula to push a button. They start to ask her menacingly if she saw a girl. They then take out two plasma guns and aim them at Casey. Athena then bursts in and fights Hugo and Ursula. She fires a time sphere that traps the two in a bubble before they can kill Casey. Athena convinces Casey to follow her as she pulls her out of trouble. She then gets Ursula to impale Hugo, and then she rips off Ursula’s head, revealing both of them to be robots. Athena grabs Casey and runs as the robots self-destruct and destroy the shop. Athena breaks into a car and uses a special key to take it. Casey learns that Athena is an Audio-Animatronic and that she knows of what Casey has seen. She admits that she planted the pin in her helmet. Casey makes Athena stop the car and leaves. Athena follows after her and gets hit by a truck. The driver runs out, giving Casey a chance to swipe the truck. Athena gets up and runs after her before catching up and hijacking the truck herself. The girls ride to find Frank’s house. Athena takes Casey far enough to leave her right in front of Frank’s house. A wild dog runs out to Casey, which turns out to be a hologram. She goes up to the door and calls Frank out. She holds the pin to the camera and then gets thrown back by a powerful blast. Frank tells Casey to go away, and that he won’t tell her anything about the pin, and that he couldn’t even take her to the place she saw because he’s been banished from there. A team of robots disguised as United States Secret Service agents goes to the burnt-down shop. The police pull out Ursula’s burnt robot head, revealing her nature to the cops on the scene, so the fake Secret Service agents vaporize them with their plasma guns to stop the truth getting out. At night, Casey sets Frank’s tractor on fire, distracting him long enough for her to sneak into his house. She finds a few of Frank’s inventions, including a recording device showing him as a child with Athena. He apparently tried to make her laugh but did not succeed. He still didn’t seem to know that she was a robot. Frank gets back inside as Casey goes to his room where he has a bunch of monitors linked around the world, along with a countdown clock. Frank has apparently built something that is about to go off in 58 days time, bringing about the end of the world. Frank has lost all hope, but Casey hasn’t, and the 100% probability meter on Frank’s screen goes down a few point. The robots then show up and threaten to attack Frank if he doesn’t give Casey up. They break in and attack, forcing Frank to use whatever inventions he prepared against them. Casey finds a portal machine and uses it on one robot, while Frank uses a laser trap to kill a few others. They go into the bathroom and hop in a tub where Frank ejects the tub and blows up his house. He and Casey land in the lake and run into Athena, and Frank is not very happy to see her. Knowing that they’ll be hunted, Frank brings Casey and Athena to a teleportation machine of his invention. Frank makes Casey cover her eyes with padding and then braces her for blood sugar loss. When they arrive at their destination, Casey falls to the floor. Athena fetches her a bottle of Coke, which she chugs instantly. They walk outside to see themselves in the Eiffel Tower. They go into a room with mannequins of Gustave Eiffel, Jules Verne, Nikola Tesla, and Thomas Edison. They were the founder of Plus Ultra, a group of inventors dedicated to finding other dreamers and inventors with the hope of shaping the future for the better. Together, their experiments uncovered a new dimension that would become Tomorrowland. Frank brings the girls to a rocket in the tower. Three robots then come in to attack. The rocket launches into the sky, with many people watching. The pod with the three inside breaks off and blasts into the next dimension. The three crash-land into Tomorrowland, which looks broken down and desolate. Nix, now the governor of the city, arrives, not surprised to see Frank and Athena. He takes them and Casey to his building where they stand on a platform that shows them a few seconds into the future using tachyons. They come across a monitor that shows certain events in time, in this case, Casey with Nate and Eddie a few days ago. Casey is given the chance to see into the future. She looks into Cape Canaveral at the NASA platform. As she goes through the time passing, the platform becomes practically destroyed. She looks all over the rest of the world and sees riots, natural disasters, and utter catastrophe. This is all because of Frank’s device, and because he gave up when he said he wouldn’t. Casey still refuses to believe this will be what happens to the world, offering another glimpse of hope. I would have liked this movie a lot better if I didn’t know that it was more-or-less just an advertisment for Tomorrowland “The Real Disney Theme Park.” The plot was cool, interesting, original, and the fact that there was no romantic crud made it even better. Well okay, there was a little romantic crud, but it was robot, human, relations …if that is possible. Our 13 year old loved it. Our 18 year old (both of them boys) was like; “I wan’t to go home and buy Will Smith’s, “Focus” on PrimeTV? He said the movie was okay. Which means he liked it, but he is 18 and the movie is sort of geared for the “not-yet-driving” teenage crowd. See the new trailer and learn more about Tomorrowland here. Mad Max: Fury Road is a 2015 Australianpost–apocalypticactionfilm directed, produced, and co-written by George Miller, and the fourth film of Miller’s Mad Max franchise. The first film of the franchise in 30 years,Fury Road stars Tom Hardy as “Mad” Max Rockatansky, who replaces Mel Gibson in the title role, along with Charlize Theron, Nicholas Hoult and Hugh Keays-Byrne. The film is set in a future desert wasteland where gasoline and water are scarce commodities, with Max (Hardy) joining forces with Imperator Furiosa (Theron) to run away from cult leader Immortan Joe (Keays-Byrne) and his army’s pursuit. The film had its world premiere on 7 May 2015 at the TCL Chinese Theatre. It began wide theatrical release on 14 May 2015, including an out-of-competition screening at the 68th Cannes Film Festival. Critics have praised the film for its acting, screenplay, action sequences, stunts, and direction. Set in the future after a nuclear war, the world is a desert wasteland and civilization has collapsed; many people are sick, others have birth defects, and some need blood transfusions. Max (Tom Hardy), a survivor in Australia, is captured by the War Boys, the army of tyrannical cult leader Immortan Joe (Hugh Keays-Byrne). Designated a universal blood donor, Max is imprisoned and used as a “blood bag” for the sick War Boy Nux (Nicholas Hoult). Meanwhile, Imperator Furiosa (Charlize Theron) drives her heavily-armored War Rig to collect gasoline. Furiosa begins driving off route, alerting Joe who realizes that his Five Wives – women specially selected for breeding – are gone. Joe leads his entire War Boy army in pursuit of Furiosa, calling on the aid of nearby Gas Town and the Bullet Farm. Nux joins the army with Max strapped to the hood of his car, to continue supplying blood. A battle ensues between the Rig and Joe’s forces. Furiosa drives into an approaching sand storm evading her pursuers, except Nux, who attempts to sacrifice himself to destroy the Rig; Max escapes and restrains Nux, but the car is destroyed by the Rig. Waking up after the storm, Max sees Furiosa nearby repairing her Rig, accompanied by the Wives: Splendid, Capable, Cheedo, Toast, and the Dag. Max steals the Rig, but its kill-switch disables the truck. Max reluctantly agrees to let Furiosa and the Wives accompany him, while Nux returns to Joe. Furiosa drives through Biker gang territory into a narrow canyon, having agreed to exchange gasoline for passage. However, Joe’s forces are close behind, and Furiosa flees while the Bikers detonate the canyon walls to block Joe’s path. Max and Furiosa fend off the pursuing Bikers but Joe’s vehicle evades the blockade and assaults the Rig. Nux boards the Rig while Joe attempts to shoot Furiosa. Splendid, Joe’s heavily pregnant wife, shields Furiosa, but falls from the Rig and is run over by Joe’s car, killing her and his child. Furiosa explains to Max that they are escaping to the “Green Place”, a location she remembers from her youth. Capable finds Nux hiding aboard the Rig, distraught that he contributed to the death of Joe’s wife; she consoles him. At night, the heavy Rig gets caught in deep mud. Furiosa and Max slow Joe’s forces with explosives, but Joe’s ally, the Bullet Farmer, pursues the Rig. Nux helps free the Rig while Furiosa shoots and blinds the Bullet Farmer. He retaliates with machine gun fire and explosives. Max wanders into the dark to confront the Bullet Farmer, returning to the Rig with guns and ammunition. As dawn breaks, the Rig travels through swampland and desert, eventually coming across a naked woman. Max identifies it as a trap, but Furiosa leaves the Rig and states her former clan affiliation. The woman summons her group who realize that Furiosa is a member of their clan, kidnapped with her mother when she was a child. Furiosa is distraught to learn that the swamp land they passed was the Green Place, which is now uninhabitable. The group agree to ride motorbikes across the immense salt flats in the hope of finding somewhere to live. Max chooses to stay behind, but after seeing visions of his dead daughter, he convinces them to return to the Citadel, which has ample water and greenery that Joe keeps for himself, and trap Joe and his army in the Bikers’ canyon. See a new trailer and learn more about Mad Max: Fury Road here. Avengers: Age of Ultron is a 2015 American superhero film based on the Marvel Comics superhero team the Avengers, produced by Marvel Studios and distributed by Walt Disney Studios Motion Pictures. It is the sequel to 2012’s The Avengers and the eleventh installment in the Marvel Cinematic Universe (MCU). The film was written and directed by Joss Whedon and features an ensemble cast that includes Robert Downey Jr.,Chris Hemsworth, Mark Ruffalo, Chris Evans, Scarlett Johansson, Jeremy Renner, Don Cheadle, Aaron Taylor-Johnson, Elizabeth Olsen, Paul Bettany, Cobie Smulders, Anthony Mackie, Hayley Atwell, Idris Elba, Stellan Skarsgård, James Spader, and Samuel L. Jackson. In Avengers: Age of Ultron, the Avengers must work together to defeat Ultron, a technological enemy bent on human extinction. The sequel was announced in May 2012, after the successful release of The Avengers. Whedon, the director of the first film, was brought back on board in August and a release date was set. By April 2013, Whedon had completed a draft of the script, and casting began in June with the re-signing of Downey. Second unit filming began in February 2014 in South Africa with principal photography taking place between March and August 2014. The film was primarily shot at Shepperton Studios in Surrey, England, with additional footage filmed in Italy, South Korea, Bangladesh, New York, and various locations around England. Avengers: Age of Ultron premiered in Los Angeles on April 13, 2015, and was released on May 1, 2015 in North America, in 3D and IMAX 3D. It received positive reviews and has grossed over $630 million worldwide. Two sequels, Avengers: Infinity War Part 1 and Avengers: Infinity War Part 2, are scheduled to be released on May 4, 2018, and May 3, 2019, respectively. In the Eastern European country of Sokovia, the Avengers—Tony Stark, Steve Rogers, Thor, Bruce Banner, Natasha Romanoff, and Clint Barton—raid a Hydra outpost led by Baron Wolfgang von Strucker, who has been experimenting on humans using the scepter previously wielded by Loki. They encounter two of Strucker’s experiments—twins Pietro, who has superhuman speed, and Wanda Maximoff, who can manipulate minds and project energy—and apprehend Strucker, while Stark retrieves Loki’s scepter. A worldwide backlash over the resulting destruction, and the fears Wanda’s hallucinations incited, send the team into hiding at Barton’s safehouse. Thor departs to consult with Dr. Erik Selvig on the meaning of the apocalyptic future he saw in his hallucination, while Romanoff and Banner plan to flee together after realizing a mutual attraction. However, Nick Fury arrives and encourages the team to form a plan to stop Ultron. InSeoul, Ultron forces the team’s friend Dr. Helen Cho to use her synthetic tissue technology, vibranium, and the scepter’s gem to perfect a body for him. When Ultron begins uploading himself into the body, Wanda is able to read his mind; discovering his plan for human extinction, the Maximoffs turn on Ultron. Rogers, Romanoff, and Barton find Ultron and retrieve the synthetic body, but Ultron captures Romanoff. The Avengers fight amongst themselves when Stark secretly uploads J.A.R.V.I.S. — who is still operational after hiding from Ultron inside the Internet — into the synthetic body. Thor returns to help activate the body with lightning, explaining that the gem on its brow – one of the six Infinity Stones, the most powerful objects in existence – was part of his vision. This “Vision” and the Maximoffs accompany the Avengers to Sokovia, where Ultron has used the remaining vibranium to build a machine to lift a large part of the city skyward, intending to crash it into the ground to cause global extinction. As the city begins to lift, Banner rescues Romanoff, who awakens the Hulk for the battle. First let me start by saying I am a fan. This is my office. 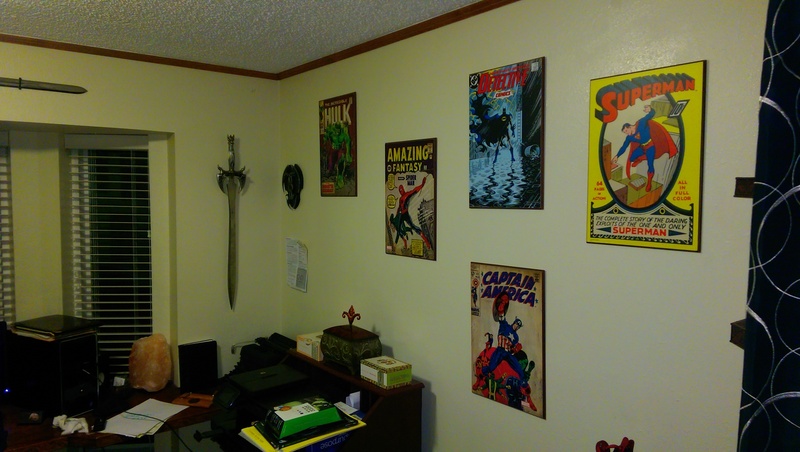 I don’t always write from here, but I do a lot of work from this room. 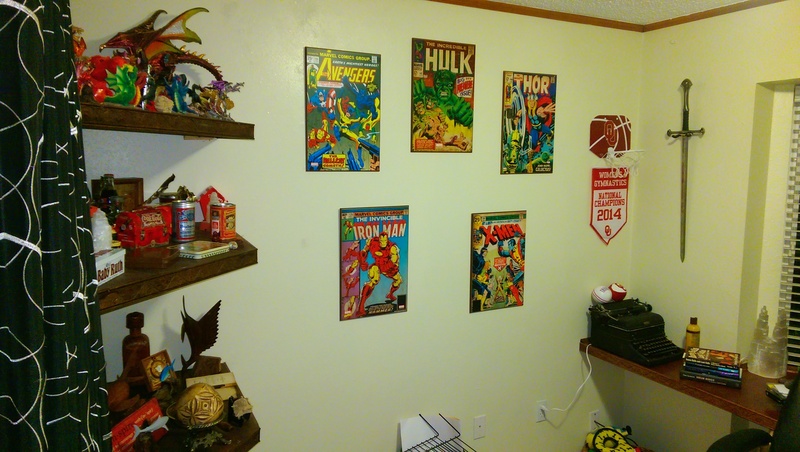 I love the Avengers, Guardians of the Galaxy, and almost everything Marvel, but this one was missing something. 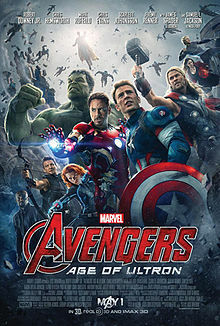 I am giving The Age of Ultron 4 stars because there was no urgency, and there were too many instances where the non-super-human heros were given men or lesser robots to fight because they would have been destroyed by the ones the Hulk, Thor, Iron Man, and Captain America were battling. AND because Pepper Potts is never seen in this one. Around here we love Pepper Potts! Find Avengers: Age of Ultron and see a new trailer here.